Late fall in the Ritsurin Garden, Takamatsu, Japan and all the lotus leaves are dead, but the lotus seed heads (Nelumbo nucifera) make an interesting composition against the background of the dead leaves.The tops of a few dried seeds can be seen in the holes. This is one of the one of the most famous historical gardens in Japan, dating to the Edo period in the early 17th century as the private garden of the feudal lord Ikoma Takatoshi. 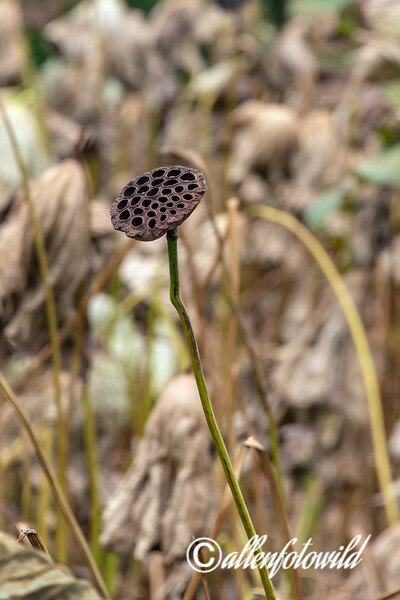 Interestingly, the seed heads can trigger trypophobia in some people, which is an aversion to the sight of irregular patterns or clusters of small holes, or bumps. Thanks a lot, John C and John! Very cool shot Terry. 17th century, wow! They are most interesting in appearance! This one reminds me of the saying by Dr, Seuss that I adopted years ago as one of my mantras: "Why fit in when you were born to stand out?" The lotus seed heads are so fascinating in their design and structure. Great capture Terry. Great shot and introduction to a new word~! This stem reminds me of the common lily pad stem/seeds that are common at Anahuac National Wildlife Refuge!